Labour MP Jo Cox’s murder was the act of a fascist terrorist inspired by relentless nationalist, anti-immigrant campaigning from mainstream politicians and the media; not, as he’s portrayed, merely a ‘loner’ with ‘mental health issues’. A man reportedly shouting ‘Britain first’ has shot and stabbed a Labour MP to death. Jo Cox, MP for Batley and Spen in Yorkshire, was shot with a home-made pistol and stabbed multiple times by Tommy Mair, a 52-year-old with a history of far-right sympathies. Mair, who resides in what is described as a semi-detached house on the Fieldhead Estate in Birstall, sent just over $620 to the NA, according to invoices for goods purchased from National Vanguard Books, the NA’s printing imprint. Mair purchased subscriptions for periodicals published by the imprint and he bought works that instruct readers on the “Chemistry of Powder & Explosives,” “Incendiaries,” and a work called “Improvised Munitions Handbook.” Under “Section III, No. 9” (page 125) of that handbook, there are detailed instructions for constructing a “Pipe Pistol For .38 Caliber Ammunition” from components that can be purchased from nearly any hardware store. Mair’s attack comes against a backdrop of increased militancy from the far-right. Hundreds of neo-nazis engaged in running battles with anti-fascists at the end of January this year (though more recent demonstrations have seen their numbers dwindle down to as low as 30) while fascist group Britain First recently held a training camp, which involved knife-fighting, and have previously threatened to target elected officials. Indeed, Britain First are not the first far-right group to have held combat training recently, with about 80-100 individuals related to various neo-nazi groups thought to have undergone similar training in 2015. The response among fascists has been varied: some are claiming it to be a set up by the state while others are openly gloating about it. However, the event says more about the political mainstream than Britain First or the wider far-right. Compare the reaction to when Lee Rigby was murdered. 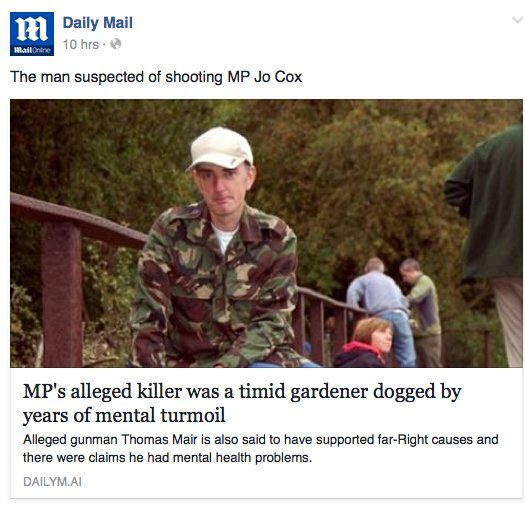 Both Jo Cox and Lee Rigby’s murders were apparently cases of lone wolf attacks by perpetrators with mental health issues who also subscribed to terrorist ideologies, which were expressed in the course of the attack. 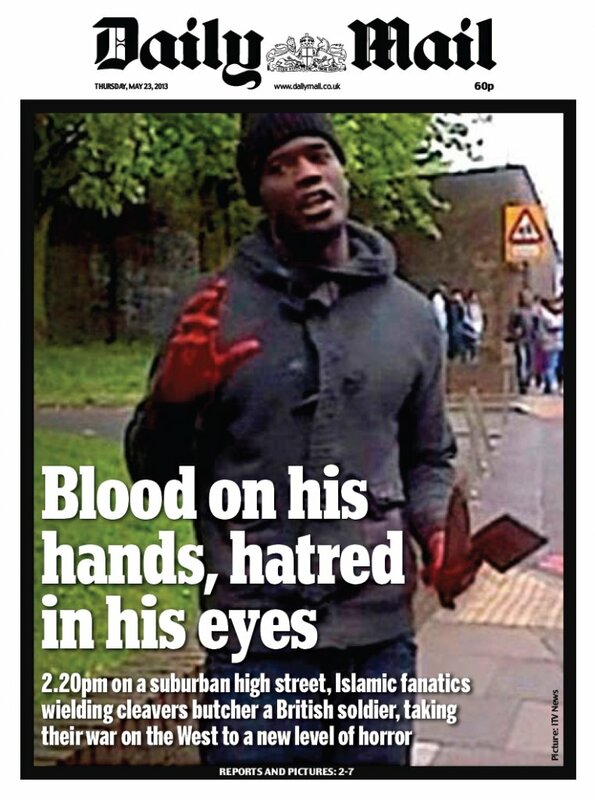 With the Lee Rigby murder, the ideology was immediately seen as the cause: there was no uncertainty, no discussion of the mental health aspect, or that they did the weekly shopping for their mum or liked to do gardening for the neighbours. Moreover, and perhaps most importantly, the attack was also portrayed as characteristic for the group they belonged to, Theresa May saying there were “thousands” more Muslims being radicalised and that surveillance of Muslims needed to be extended. With Jo Cox, there is no similar emphasis on Tommy Mair’s ideology, it’s only mentioned as part of his “history” of mental health problems. He is not called what he is: a fascist terrorist. His attack doesn’t tell us anything about the group he belongs to (i.e. white British people) but rather is in conflict with how the media/politicians like to present it and so needs to be portrayed as an aberration. No one is speculating on whether there could be loads of white British blokes quietly sympathising, no one is worrying about internet radicalisation (despite Britain First having almost 1.5 million Facebook ‘Likes’). Finally, no one is demanding that Farage and other Brexit leaders condemn political violence; indeed, the idea that they (and white British people in general) should have to account for Tommy Mair’s act is hilarious in its ridiculousness. The same cannot be said when similar calls are made upon the Muslim community. 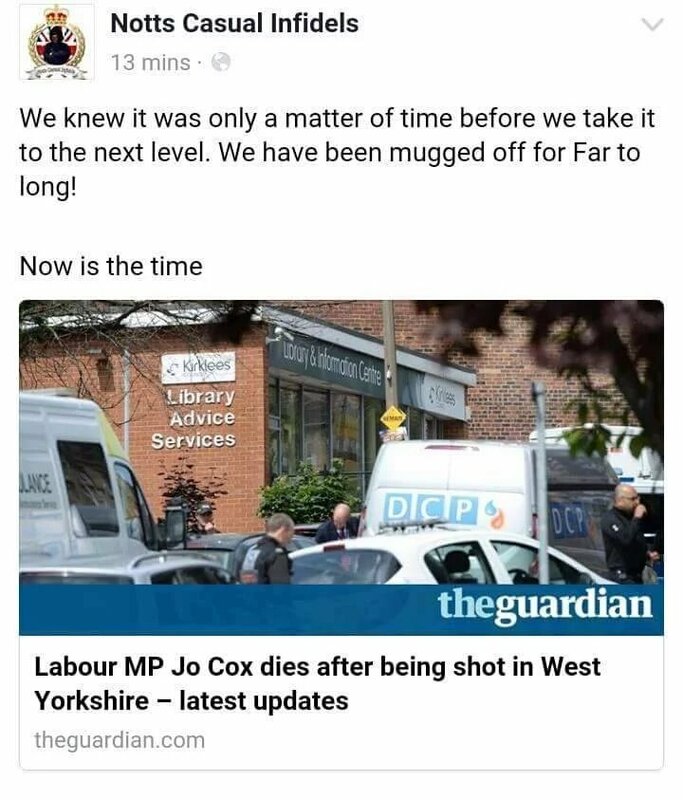 Ironically, shortly before the murder, the media story was all about how Labour had betrayed its natural constituency because supposedly it didn’t pander sufficiently to white working class racism (which apparently the media think is characteristic of the white working class whose voice isn’t heard). Couldn’t the Labour Party promise to crack down on immigrants? Couldn’t there be some really quick negotiation with the EU seven days before the referendum to abolish free movement? Then a racist white bloke murders a Labour MP, prominent campaigner for Remain and Syrian refugees and all of a sudden this act is no longer characteristic of the white working class and can only be explained in relation to his mental health. Similarly, this attack comes less than a year after Cameron said the Labour Party was a threat to national security, just over a month after the Conservatives ran a campaign for London Mayor claiming the Muslim Labour candidate was sharing platforms with ISIS (a campaign judged “outrageous” for its divisiveness by the Conservative group leader on the Greater London assembly). It comes a month after Farage saying the UK had lost complete control over immigration, and that violence was the next step if voting didn’t help. It even came on the same day he revealed a poster of a flood immigrants coming to destroy the UK, which looked extremely similar to the imagery of an old Nazi propaganda film. No doubt it is these racist narratives across the mainstream political spectrum that legitimise murderous violence and make it socially acceptable in the minds of fascist lone wolves. Indeed, Tommy Mair and others like him are not aberrations from the political mainstream; rather, they’re just reading between the lines of it. Based on comments, particularly from libcom user no1, on the libcom thread discussing the event.